What does President Obama Think of Paul Ryan? Flashback! President Obama has a history of being openly and harshly critical of the newly-minted GOP vice presidential candidate Rep. Paul Ryan , most recently slamming his signature budget plan as a " Trojan Horse " and " thinly veiled Social Darwinism ." Obama has also aggressively sought to tie rival Mitt Romney to the Ryan Budget, saying at the Associated Press luncheon in Washington on April 3 that it "is now the party's governing platform. This is what they're running on." "One of my potential opponents, Gov. Romney, has said that he hoped a similar version of this plan from last year would be introduced as a bill on day one of his presidency," Obama said. "He said that he's very supportive of this new budget. And he even called it ' marvelous ,' which is a word you don't often hear when it comes to describing a budget." To laughter, the president chuckled and added, "It's a word you don't often hear generally." Obama was equally mocking a year earlier, when he famously ridiculed Ryan for his budget plan - while he sat in the crowd. "This vision is less about reducing the deficit than it is about changing the basic social contract in America," Obama said on April 13, 2011 , at a speech on fiscal policy at George Washington University. "Ronald Reagan's own budget director said, there's nothing 'serious' or 'courageous' about this plan.," he said. " There's nothing serious about a plan that claims to reduce the deficit by spending a trillion dollars on tax cuts for millionaires and billionaires. And I don't think there's anything courageous about asking for sacrifice from those who can least afford it and don't have any clout on Capitol Hill." Perhaps dialing it back a bit several days later, Obama several days later praised Ryan as "sincere" and a "patriot." 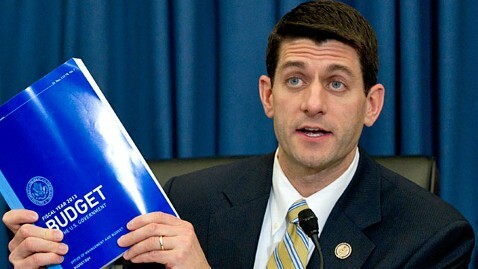 "I do think Mr. Ryan is sincere. I think he's a patriot. I think he wants to solve a real problem which is our long-term deficit, but I think that what he and the other Republicans in the House of Representatives also want to do is change our social compact in a pretty fundamental way," he said at a Facebook Town Hall on April 20, 2011.